Visiting questionable websites or keeping your PC’s system unprotected might cause the infection of Windows Advanced Toolkit. This application, even if it seems to be legitimate, is simulated software designed to trick you into believing that the system is at risk. Do not trust this application, because it is a copy of Windows Proactive Safety, Windows Maintenance Guard and other fraudulent programs which can get into the system unnoticed and start terrorizing you with imaginary infections. All these applications belong to Rogue.VirusDoctor family because the way the malicious application work and their characteristics are identical. Removal of the rogue is highly advisable when this bogus software is noticed on the computer. As the writers of Windows Advanced Toolkit understand that it is not enough to present infections to deceive you into thinking that the system is at risk, the rogue is designed to corrupt the processing of the system so that you cannot resist a temptation to remove infections by using the fake version of the rogue. So, the malware disables the Internet and hides Task Manager not to find the processes of the rogue. Moreover, the infection hides Registry Editor where some changes concerning certain executable files are made. Due to the presence of Windows Advanced Toolkit, some executable files cannot be launched to detect and remove the malware. If these factors are the agents for your wish to activate the rogue, then you are in big trouble. If you activate the rogue after purchasing an activation key, you lose your money, because, first, Windows Advanced Toolkit cannot detect and delete anything, and, second, it aims to get your money and access to it; therefore, do not make a payment, but get rid of this infection. The deletion of Windows Advanced Toolkit is much easier if you activate the rogue, but note that the activation key is now accessible to everyone at no charge. The magic of the key lies in a renewal of Registry Editor, Task Manager, the Internet, etc. For example, Registry Editor is necessary for the manual removal of Windows Advanced Toolkit, because certain registry entries should be deleted to terminate the infection. 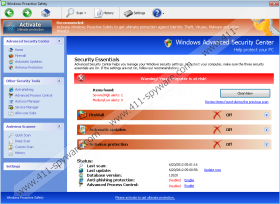 If you want to eliminate the infection on your own, but you have a feeling that you cannot do it by yourself, remove Windows Advanced Toolkit with a removal tool. Find a certified and powerful antispyware capable of detecting and deleting the rogue so that the infection can be removed flawlessly. The removal tool will do both remove the infection and protect the system against future infections.